The tall ship Star Flyer will operate in the Baltic for the first time next year, sailing into some of the world's great seafaring ports including Copenhagen, St Petersburg and Stockholm. The 170-passenger square-rigger will also call at smaller ports rarely visited by bigger ships offering a rare opportunity to cruise the scenic islands and coastlines of the Baltic and Scandinavia. In May, a series of short cruises out of Hamburg and Warnemunde/ Rostock, a German port with a great sailing tradition, will coincide with the spectacular annual Sailing Parade of tall ships from many parts of the world. A discount of five percent applies to all bookings before January 31, 2012. For some cruises the discount is 10 percent. Children may qualify for a 50 percent discount. three cruises of 10 or 11 nights, including an overnight in St Petersburg, round-trip from Stockholm, renowned for the dramatic scenic route that all ships take, entering or leaving the historic harbour through an archipelago of hundreds of tiny islands. Ports of call include Visby (Sweden) Tallinn (Estonia) Helsinki, Hanko and Mariehamn-Aaland (Finland). Fares start at $4737. seven nights Oslo/Copenhagen calling at Marstrand, Goteborg, Halmstad and Helsingborg (Sweden) and Kalundborg (Denmark) from $3162. seven nights Hamburg to Oslo calling at List-SYlt (Germany) Esbjerg (Denmark) Kristiansand and Arendal (Norway) and Stromstad (Sweden) from $3319. All prices are per person and include port taxes and all meals and entertainment on board. Antwerp and Zeebrugge; and five, six and seven-night sailings to and from Warnemunde/Rostock, visiting ports in Germany, Denmark and Poland, Sweden and Oslo. Mikael Krafft, the Swedish founder of Star Clippers, said: "It has always been my dream to bring one of our square-riggers back to myown personal roots in Sweden, and to offer our guests the opportunity to sail in a region that has such a magnificent heritageof tall ship sailing. As well as the Baltic¹s capital cities, we have included several small, very beautiful ports of call in our summer 2012 programme, to show our guests the incredible diversityof this stunning region, not to mention some of the finest sailing conditions in the world." 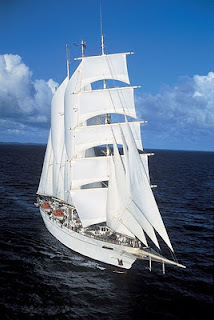 Star Clippers operates three of the world's largest and tallest sailing vessels, visiting ports often untouched by larger cruise ships and offering passengers the activities, amenities and atmosphere of a private yacht. All three ships have expansive teak decks, swimming pools, informal dining, a convivial Tropical Bar on deck, a comfortable piano bar and first class accommodation and dining. The two smaller ships, Star Flyer and Star Clipper, take 170 passengers each, with a crew of 70, and Royal Clipper carries 227 with a crew of 106.